Tim Chaffey of Answers in Genesis: I’m blessed to bring Noah’s Ark to life for millions of Ark Encounter theme park visitors. Okay, these weren’t the exact instructions my team received, but they aren’t far from the mark. First, we don’t know what gopherwood was, so we can’t be sure if we followed that instruction. 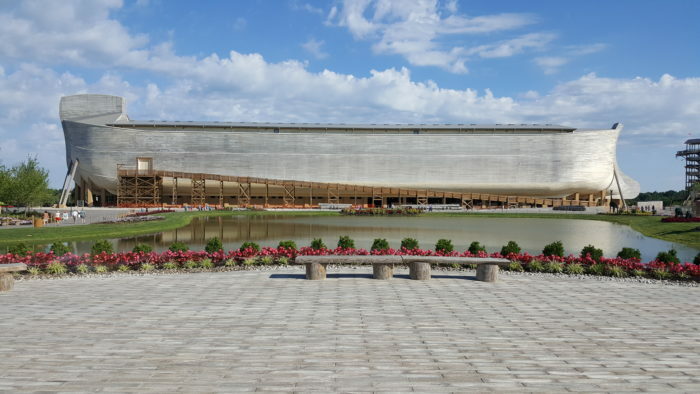 Second, I wasn’t involved in the actual building of the full-size ark in Williamstown, Kentucky. The fact that it’s still standing testifies to my non-involvement in its construction. 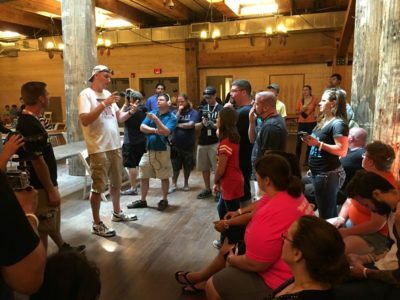 However, as part of the design team responsible for developing the exhibits on the ark, I had, and still have, the unique privilege of producing the content for the exhibits. Working behind the scenes at the design studio is an unbelievable blessing. Like any other job, some days are better than others, but playing a key role in bringing Noah’s Ark to life for millions of visitors to the theme park makes our labors worth the effort. It helps that my coworkers are committed Christians who desire to use their amazing talents to glorify God, edify believers, and reach the lost. This article will highlight some of the ways our team depicted the story of Noah and his family, their task, and their challenges. 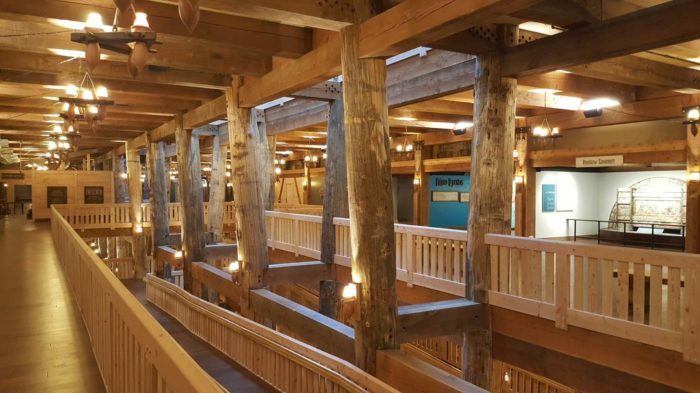 The Ark Encounter exhibits can be divided into two categories: themed spaces and teaching exhibits. Themed spaces are decked out with characters, animals, props, etc. to give guests an idea of what life may have been like on the ark. Teaching exhibits include more content and explain the feasibility of the ark and the trustworthiness of Scripture. Each teaching exhibit began with a brainstorming session involving the project’s lead designer, the exhibit designer, our lead graphic designer, and me, the content guy. During these meetings we discussed what topics we needed to address in the space and how we wanted to present the material (dioramas, videos, signage, props, etc.). Afterward, I worked closely with the exhibit designer. While I worked on the content he laid out the floor plan and designed the look and feel of the room(s). This allowed us to determine how much space we would have for signage. Since we rightly anticipated huge crowds, I was forced to keep the wording brief while still addressing the necessary points. The designer then constructed a small model, and we presented it and the content to our ministry’s president, Ken Ham, and to our review board. Upon approval, I sent the content to our graphic design team who took my text and transformed them into works of art on attractive signs. Our fabrication shop worked with the exhibit designer to build the walls, props, and anything else that needed to be in the space. 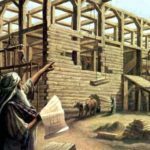 While the exhibits were being designed, written, and fabricated, the ark itself was being constructed. Due to the enormity and uniqueness of the project and a long, wet winter in Williamstown that year (2016), our team had to rush to install all the exhibits in time for the ribbon-cutting ceremony on July 5. Pardon the shipbuilding terminology, but it was all hands on deck for the installation process. Even this writer learned how to properly hang signs in the exhibits. We put in many long hours, but it wasn’t always toilsome. 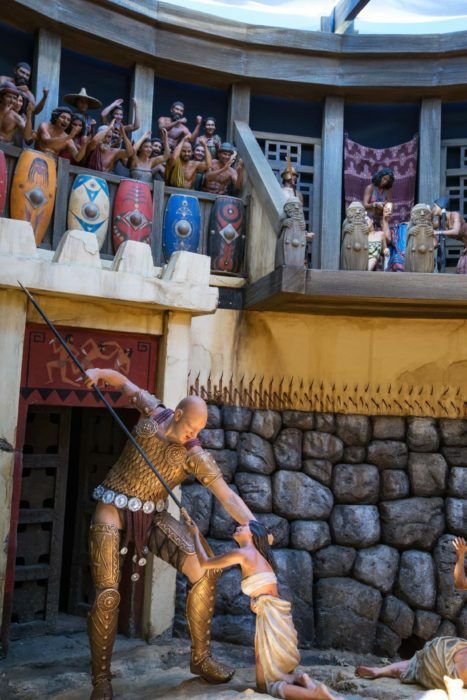 Since I’m quite tall (6’9”), I served as a model for a giant character we decided to put in a diorama depicting some of the violence in the pre-Flood world. To make all the diorama characters appear lifelike, we contracted a company that brought in an array of over seventy cameras that were placed at different levels in a circle. I posed in the middle and with a click of the button, all 70+ cameras fired at once. A computer combined the pictures to create a 3D image, which was then sent to the 3D printer. The figure was then painted and installed in the diorama. So visitors to the Ark can see me as a giant warrior in the pre-Flood world. For the Who Was Noah? exhibit, I was instructed to develop a plausible storyline to explain how Noah might have acquired the necessary skills to complete his God-given task. Using the scant details in Scripture, I crafted a story that served as a basis for personal details and props for each of the family members that can be seen in many of the themed spaces. 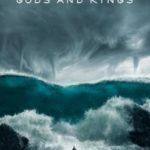 Beginning with the assumption that God prepares His people to do His work, I set out to give the world a different picture of Noah than what they might have seen in Sunday school and much different than the one from the regrettable 2014 Noah movie. Instead of being a farmer or vintner (which he became after the Flood), I depicted Noah as someone with an interest in woodworking and construction who became a shipbuilder’s apprentice and then worked as a shipbuilder for much of his life. That way, when God tells him to build the Ark, Noah has a good idea how to do it. When I presented the storyline to others, many of them encouraged me to turn the story into a novel. After a couple years of planning, I coauthored The Remnant Trilogy, which follows Noah on a coming-of-age adventure from his young adult years to the time of the Flood. The third book, Noah: Man of God, is due out next month (May 2018). 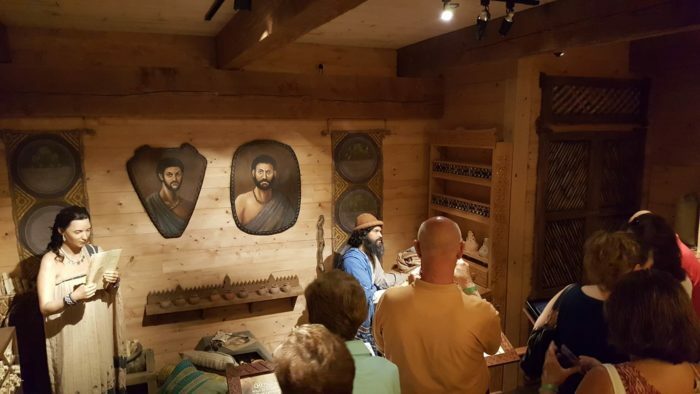 The series serves as a semi-official backstory for Noah and his family at the Ark Encounter, and visitors to the theme park can see many of the items and animals they read about in the novels. 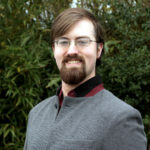 As content manager for attractions at Answers in Genesis, Tim Chaffey oversees research and writing of content used to develop and explain the many exhibits at both the Creation Museum and the Ark Encounter. Chaffey joined Answers in Genesis in 2010 after serving many years as both a pastor and a science and Bible teacher. After earning a Bachelor of Science in Theological and Biblical Studies, Chaffey completed an M.A. in Biblical and Theological Studies, an M.Div., specializing in Apologetics and Theology, and a Th.M. in Church History and Theology. I LOVE that you gave a group of atheist protestors a tour! How did they respond? Hi Lauren, thanks for the question. At the protest itself, held at the I-75 off ramp, many of the protesters were fairly obnoxious (as were a couple of Christians holding up signs that merely produced shouting matches), although there were plenty of protesters who were open to civil discussions. Of the roughly 20 protesters who toured with us, only one of them was rude during the tour. This particular person kept making snide comments and personally attacking me. At one point, the individual gave me a perfect opportunity to deliver a zinger, so I did, and he/she didn’t speak up again. Several folks in the group thanked me for it because he/she was making them all look bad. The rest of them were very respectful throughout the tour and had some good questions. Of course, we anticipated most of them and had already installed signage to address the objections, so I could simply say, “That’s a great question, here’s a sign that deals with this idea.” They were very impressed with the structure itself even though they obviously didn’t agree with our message. About half the group needed to leave after the Q&A, but the other half stuck around, and I talked with a couple guys for at least another hour. 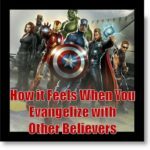 In the days that followed, many of them blogged about the experience, and the one common theme that kept coming up is that they were pleasantly surprised by the genuine conversations that they had with some of the Christians who came to witness to them. One person made the remark that I’m no fake — that I really do believe what I’m teaching. 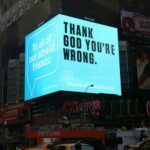 That might seem strange to people since it should be rather obvious, but some of these people never or rarely go outside of their atheist bubbles or huddles. They tend to think that all Christians act like the despicable folks from Westboro Baptist or that we are just in ministry for the money (that’s pretty funny, I know, but they see the televangelists so I guess there’s a little bit of basis for the stereotype). Sadly, many Christians do something similar by thinking that all atheists act like Richard Dawkins. But both views are destructive. We need to look past those stereotypes and deal with the person. In reality, we are all people made in the image of God, and I believe those people are worth going after. I have so many memories from that day that I will always cherish, and I’m not exaggerating when I say that I would be willing to do that every day. It really was an incredible opportunity and made the Ark’s opening day far better than I ever imagined it would be.